Hello friends! 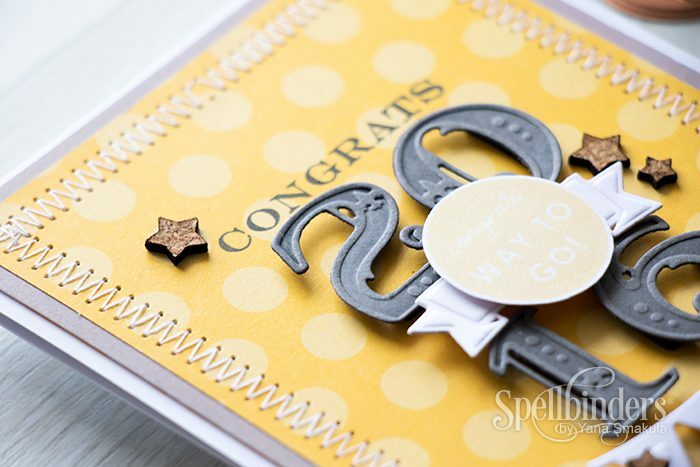 I have a graduation card I created for Spellbinders blog to show today and I’m also sharing a look at the new mini Prizm die cutting and embossing machine from Spellbinders. Its a small and portable machine (it literally fits inside a handbag), perfect for taking with you to a crop or for kids crafts. 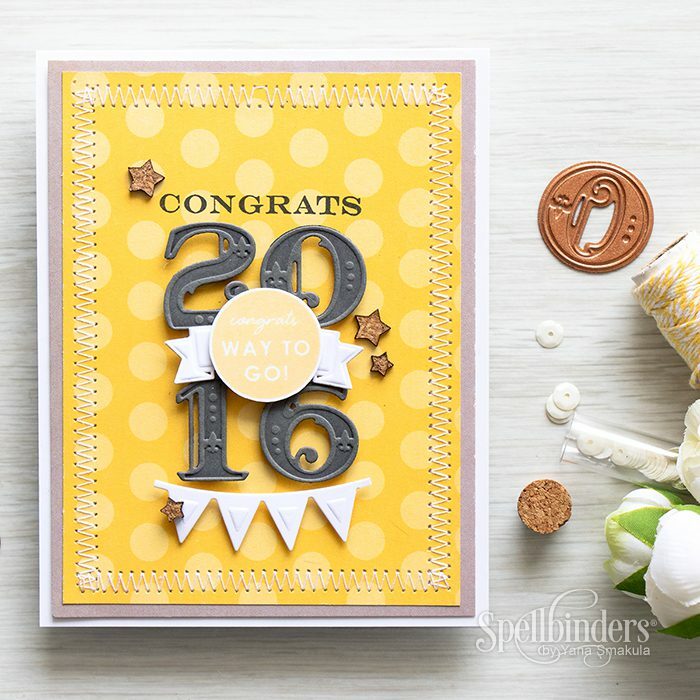 If you haven’t seen this machine before (Spellbinders had it at their CHAW’16 booth) – watch this video here. This machine is even smaller than my favorite Artisan X-Plorer, but it still cuts a number of dies and lets you create various projects. I’ve also filmed additional videos with this machine, you can watch them on Spellbinders Youtube channel: Oceans of Joy | Cheer Up Friend | Spring Thanks. 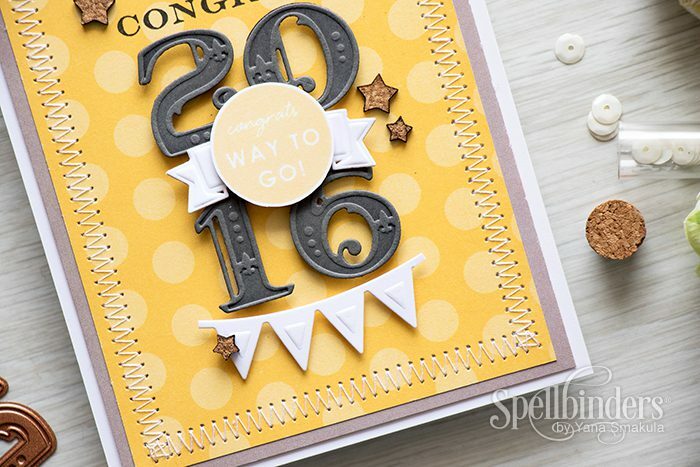 I started by die cutting numbers 2016 out of dark gray cardstock using Victorian Numbers dies from Spellbinders. 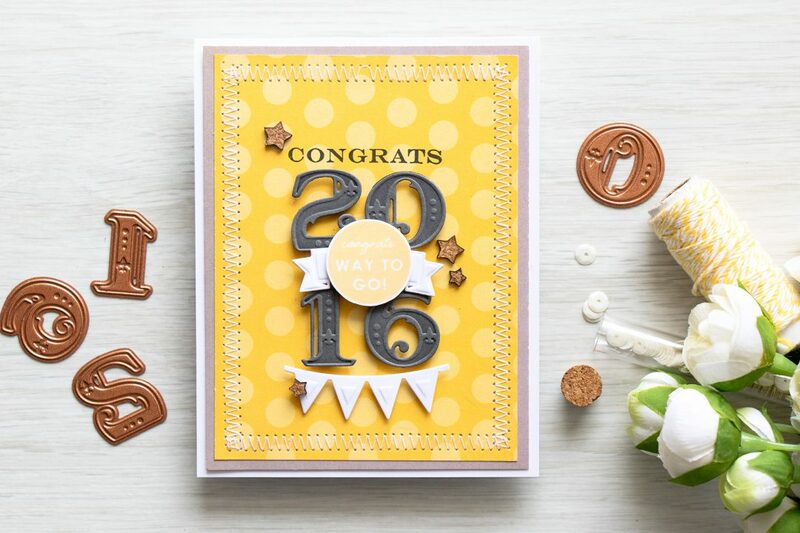 This particular set not only cuts, but also debosses the shape so there’s no need to dress it up any further – you simply cut it and have a gorgeous die cut right away. I also created a base panel for my project – I used yellow polka dot paper and gray paper and stitched those panels together using my sewing machine (I love adding stitching to my handmade cards). After I arranged the numbers onto the panel and foam mounted them I also stamped Congrats in black ink directly onto the yellow polka dot panel; die cut and embossed a little banner and garland out of white cardstock and foam mounted those onto the card. Another sentiment was stamped using very light yellow and foam mounted over the banner. I also embellished this card using a few cork stars. These numbers dies are so cool! Great details. Your card is stunning! Yana, this is an awesome graduation card. Those numbers are simply divine! Love your card and those numbers are fantastic. Such a cute little machine, that would be great for travelling or even just as a back up. Such a great card! I’m surprised at how small that new machine is. Can you use embossing folders (Darice) with the Prizm? My aunt wants to use her border embossing folders.